The Recording Academy announced today that Joe’s album, 75, won the Grammy award in the category Best Contemporary Jazz Album. Other nominees in that category were Urbanus, Stefon Harris & Blackout; Sounding Point, Julian Lage; At World’s Edge, Philippe Saisse; and Big Neighborhood, Mike Stern. It was Joe’s first Grammy win for an album under his own name. Several of his post-Weather Report albums were nominated, as was the Zawinul-produced Salif Keita album, Amen. Congratulations to Joe and the Zawinul estate. 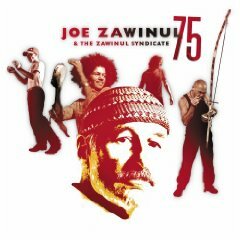 The Zawinul estate has relaunched the official Joe Zawinul web site at zawinulmusic.com. A couple of tidbits from the news section: The estate is planning a Zawinul legacy band, and Joe’s son, Anthony, is in the process of filming a documentary about Joe’s life. No details on either of these projects, so we’ll have to see what happens.